My youngest blessing was a special surprise. He was born full-term and perfect to me. At birth we were told that he had some Down Syndrome markers. At first I was in denial, shock and very fearful of the future. My husband handled it with grace. God had told him about 2 weeks before his birth that Mattie would have DS, but my husband didn't tell me. There are many stories of mothers and their deep love for their "special" children and what a surprise blessing they were. I love Mattie so much and he is such a treasure to our family. I wanted to write this though, to encourage women that having a baby with DS is really not a scary thing. It's not even a negative. I know, I was one of those women that never would of asked for a special needs child, but now that I have had a child with DS, I would even welcome another one! If you are a woman thinking of having another baby, but because of your age or another reason are scared, don't be! If God blesses you with one of these precious children, you will be thrilled! My Matt is the easiest, sweetest baby ever. I feel so privileged to raise him. I feel like I am in a private little club with all the other women with DS children. It is truly the best club that you would never ask to join! Love this post...I know people have asked me if I had another would I be afraid of this...how could I be? I would love him/her more than anything. I LOVE that picture...his sweetness sure shows through those eyes! Saw your blog headlined (!!) on MommyLife. I also homeschool and have a child with Down syndrome. It is a wonderful little club to belong to as a parent of a child w/Ds. I've me so many wonderful people because of my daughter. I also saw your blog on MommyLife...thought I'd stop by since I'm part of the club too :) We have two children with DS and I loved your post about Mattie! 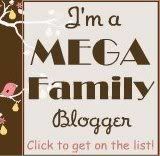 Looking forward to spending more time on your blog! I've noticed that down syndrome people are one of the happiest people around!! I have nine children and now that I'm in my 40's I get the comments...you know the ones...the comments that tell me I should "stop" having children because my risks of having a child with DS go up. I guess at the age 41 it's like 1 in 100 chance? Well...in all honesty, that doesn't discourage me. Should I be blessed with another baby, and that baby has DS...that chid will be loved so much! And cherished! And will bring such blessings to our family. And as far as having a child with special needs...sometimes you can have a perfectly normal child who because of an accident later in life becomes a child with special needs. Life holds no guarentees. I learned this lesson back in 1997 when my second child, Audriana, was brain injured in a car accident at the age of four. I suddenly had a child with special needs who would need extra care and assistance to some degree for the rest of her life. This doesn't change my love for her. In fact, if I had found out during my pregnancy with her that she would be born normal but later in life become disabled, I would still have chosen to have her. I don't see how it's any different with a child with DS. It makes me so sad that so many ds babies are aborted. All life is precious. All life has value. This post is absolutely amazing.